This Folder is used as a bill Folder in Restaurants. The Bill Folder offered by us is available to clients in different sizes and is widely used in commercial establishments. Different design and color available. 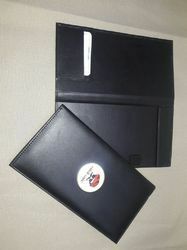 We are manufacturers of menu and bill folders, the folders are made in rexine or leather as required. We offer exquisite collection of leather menu folders and bill folders in different designs & styles. Customization with regard to printing is also done on bulk quantities. 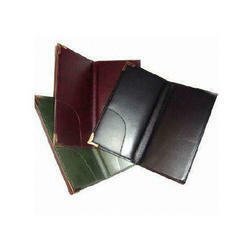 Matching up with the requirements of our clients, we are involved in offering Leather Bill Folder. We offer exquisite collection of leather & leatherite Finish Menu folders and Bill folders in different designs & styles. Customization with regard to printing is also done on bulk quantities.